Ex-West Ham striker Emmanuel Emenike is not fit enough to make his debut for Las Palmas in their La Liga clash against Athletic Club on Friday, February 9. For the second straight match day, the Olympiakos loanee was omitted from the list of 18 players summoned for the game that will be held at San Mamés Barria (Bilbao) by manager Paco Jémez. On Wednesday, Emenike was sighted training with other first-teamers, including Super Eagles midfielder Oghenekaro Etebo, who has been named to the latest roster announced today. Speaking at a press conference on Thursday, Paco Jémez refused to be drawn into speculation that Emenike was left out of the 18-man squad because he is overweight. La Provincia claims the Nigerian was overweight when he joined Las Palmas and must lose four to five kilos to be in tip-top condition. Emenike has been inactive since October 28 when he was named in Olympiakos starting line-up against Panathinaikos. 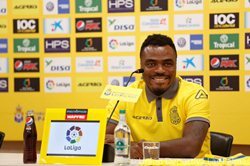 Both Emenike and Etebo are on loan at Las Palmas until the end of the 2017-2018 season.